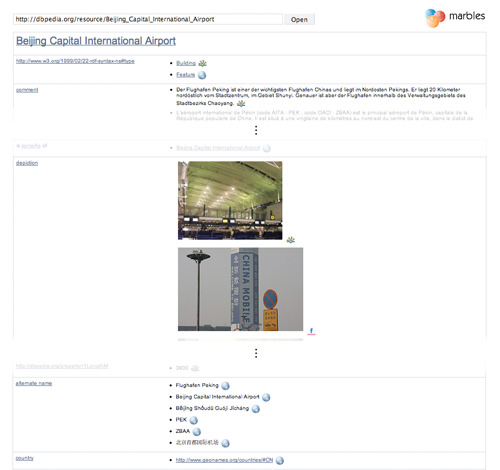 A full details view of Beijing Capital Airport that includes data from DBpedia, GeoNames and the flickr wrappr. 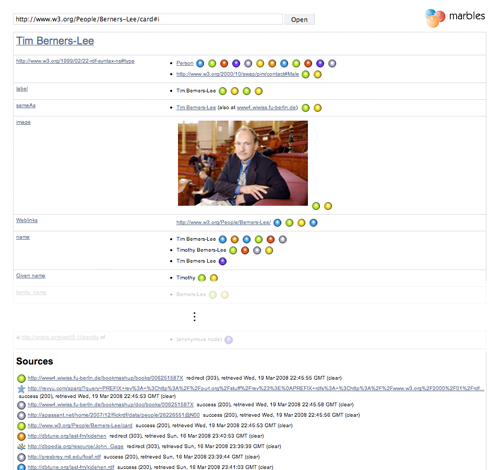 A full details view of Tim Berners-Lee's FOAF profile with data sources indicated using "marbles"
Marbles is a server-side application that formats Semantic Web content for XHTML clients using Fresnel lenses and formats. Colored dots are used to correlate the origin of displayed data with a list of data sources, hence the name. By performing all formatting, data retrieval and storage activities on the server side rather than on a potentially thinly equipped client, the view generation can touch on large amounts of data and requests can be answered relatively quickly. Marbles provides display and database capabilities for DBpedia Mobile. Public installations of Marbles are located at http://wifo5-04.informatik.uni-mannheim.de/marbles/ and http://mes-semantics.com/marbles/. Use the following form to start browsing with it. 2009/06/05: Added ANTLR properties in marbles.policy that prevented abstract view generation (thanks to Simon Reinhardt). 2009/05/28: Initial release of Marbles 1.0 on SourceForge. Apart from a full details view that lists all known properties for resource, Marbles allows for the generation of Fresnel-based views that are complemented by corresponding CSS stylesheets. The summary view features a short text describing the resource and optionally an image, a link to the resource's foaf:homepage and reviews from the Revyu rating site if existent. The photo view provides photos for a given resource. These are often provided by DBpedia, FOAF data, or the flickr wrappr. Data is retrieved from multiple sources and integrated into a single graph that is persisted across user sessions. When provided with the URI of a resource to display, Marbles tries to dereference it. In parallel, it queries Sindice and Falcons for datasources that contain information about the given resource, and Revyu for reviews. In a similar manner as the Semantic Web Client Library, Marbles follows specific predicates found in retrieved data such as owl:sameAs and rdfs:seeAlso in order to gain more information about a resource and to obtain human-friendly resource labels. Marbles can act as a SPARQL Endpoint and supports the SELECT, CONSTRUCT and DESCRIBE forms. The endpoint URL is provided by the marbles servlet. The public service is http://www5.wiwiss.fu-berlin.de/marbles. Discovers an URI (see below) and renders a given view. Tries to dereference the URI and queries Sindice, Falcons and Revyu for data; then follows known predicates. This section explains how to set up a local copy of Marbles. If you just want to use Marbles, the public endpoint will be around for a while. Obtain the .war distribution in the SourceForge project download area and place it into a J2EE web container, such as Tomcat. Marbles should automatically get installed. Alternatively, you can invoke the ant install and remove tasks on the source distribution. Here's how to set up ant to do this. The Marbles servlet can then be invoked at the directory root, e.g. http://localhost:8080/marbles-1.0/, or /<installation path>/marbles for pre-2.4 servlet containers. A sample policy file is provided in marbles.policy, which would be placed under conf/policy.d in a Tomcat setup. Consider disabling security settings if things don't work right from the start. By default, all stores are automatically created as file-based stores under the WEB-INF/data/stores directory. For performance reasons, it is recommended to place the cache store in a MySQL-based RDBMS store by supplying appropriate login information in web.xml (see Configuration). MySQL's wait_timeout should be set sufficiently high to prevent disconnection when the server is idle (this value defaults to 8 hours). Marbles also profits from a high key_buffer value. marbles.cnf contains a recommended configuration for a machine with 1 GB RAM, which may be placed into /etc/mysql/conf.d. Note that for better performance, automatic purging of the database was disabled as it occurs randomly and blocks all writes for a long period. If required, the database should simply be dropped as a whole, along with the metadata store. Marbles is configured using the servlet configuration file WEB-INF/web.xml, which is found in the extracted application container after installation. The default values allow Marbles to work "out of the box", but the settings need to be changed to set up a MySQL-based store etc. The Marbles assetsURL and serviceURL settings should be set to reflect the new paths, as these will be sent in the HTML output. The SIMILE Fresnel Engine supports labels specified using rdfs:label and dc:title for vocabulary items. To incorporate labels for custom ontologies, place those them the directory <data>/ontologies. Ontologies are added into the ontologies store upon servlet initialization. The source code is available on GitHub. JavaDoc is provided here. SIMILE Fresnel Engine and IsaViz FSL; both were tweaked to support provenance and performant access to large graphs. The open-sourcing of Marbles was supported in part by a research grant from Eli Lilly and Company. We are very interested in hearing your opinion about this service. Please send comments to Christian Becker and Chris Bizer.